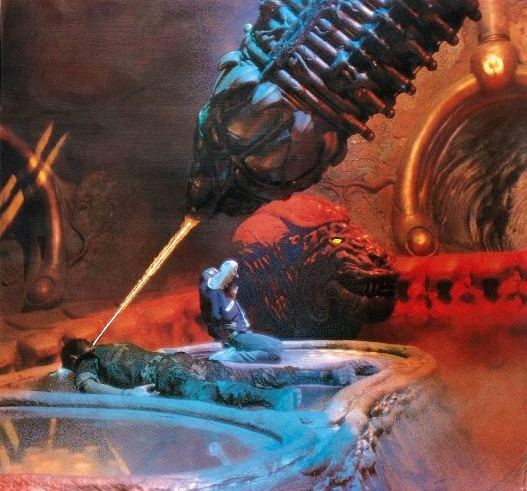 INVADERS FROM MARS (1986): The Chainsaw Auteur Gets Kid Friendly – Schlockmania! 1985 and 1986 were heady years in the career of Texas Chainsaw Massacre auteur Tobe Hooper. Those two years saw the release of a trio of big-budgeted films that he made via a deal with Cannon Films. None of them were hits during their original release but all three represented Hooper doing what he pleased with Hollywood-level financial resources. The oddest of the pack was Invaders From Mars, a remake of ’50s sci-fi favorite that found Hooper trying to adjust his aesthetic to make a movie for kids. 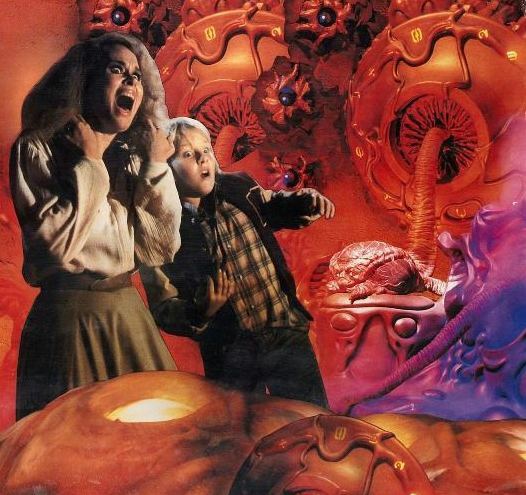 The 1986 version of Invaders From Mars follows the basic plot progression of its inspiration: young tyke David Gardner (Hunter Carson) sees a big spaceship land behind the hill in his backyard and tries to convince the grownups about what he saw. However, the Martians aboard that ship use their technology to mentally enslave anyone who wanders into the area, including David’s dad (Timothy Bottoms), mom (Laraine Newman) and, worst of all, his crabby school teacher (Louise Fletcher). In short order, David finds himself on the run from all the Martians’ new minions. He finds help from the quirky school nurse (Karen Black) and a squad of Marines led by General Wilson (James Karen) – but they all have to face down the Martians in their own lair and the invaders have plenty of high-tech tricks up their sleeves. Hooper’s r emake isn’t really good or really bad. It’s one of those strange films where the odd combination of attributes and flaws makes the overall quality seesaw back and forth. On the plus side, the film is handsomely shot by Daniel Pearl and there is a beautiful sense of spectacle created by top-shelf technicians: Leslie Dilley designed the amazing Martian spaceship sets, John Dykstra gives an ILM-level of quality to the film’s spaceship and laser effects and Stan Winston’s Martian creature designs have a nice comic/grotesque sensibility, like Basil Wolverton drawings brought to life. The production values often give the film the feel of an ersatz Spielberg production, perhaps something that Joe Dante might have directed for him. On the minus side, Invaders From Mars never gels despite its impressive resources. The script starts nicely as a kid-level version of a paranoid thriller but gets swamped in showy effects and overblown action during its final half-hour. While the film moves at a decent clip, Hooper never quite nails the pacing or the tone. He seems uncertain as a director here, suggesting he’s just a poor fit for this material. His uncertainty is reflected in the performances: Bottoms and Newman hit the right deadpan tone but Fletcher camps it up, Carson is rough around the edges and Black is so weird here she seems to be acting in a different film from everyone else. 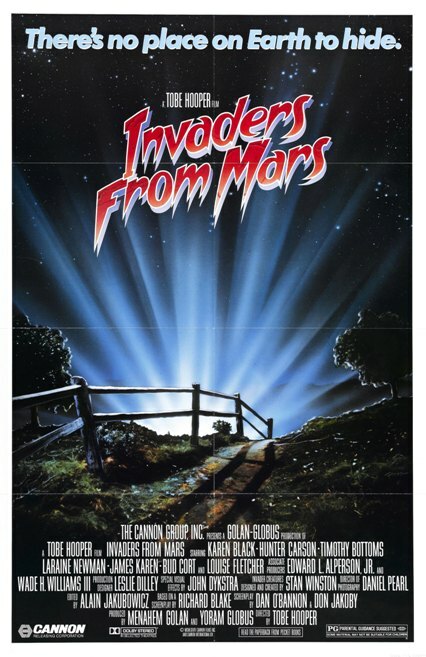 Thus, Invaders From Mars is probably the least of Hooper’s “Cannon trilogy” as it lacks the gonzo ambition of Lifeforce or the satirical bite of Texas Chainsaw Massacre 2. A viewer’s reaction to it will vary depending on their sensibilities: either you’ll be intrigued by its quirky approach to big budget fare or put off by its overblown, inconsistent approach.